We have already reported the voting down of an attempt by some shareholders of Tokyo Electric Power Company, or TEPCO, which would have made the company abandon all nuclear energy generation. We can now report that a similar action was attempted at the annual meeting of Tohoku Electric Power Company, and was also voted down. Later update: We can add Kansai Electric Power to this group. TEPCO owns and operates Fukushima Daiichi, Fukushima Daini, and Kashiwazaki Kariwa nuclear stations; this latter is by virtue of rated plant capacity the most powerful nuclear generating station on Earth. Tohoku Electric owns and operates Onagawa and Higashidori nuclear stations. Further news in the general field of nuclear energy in Japan... Minister Kaieda had requested that the mayor of Genkai town allow the restart of Genkai nuclear station in his jurisdiction, and the mayor has indicated that he WILL allow the plant to restart. Genkai is owned and operated by Kyushu Electric Power Company. Although the sighting of one swallow does not necessarily herald the arrival of Spring, it does appear that the predictions in some quarters that Japan would abandon nuclear energy were incorrect. Labels: "tepco" "tohoku" "kyushu" "japan"
As much as the anti-nuclear authors / bloggers / reporters / experts would like it not to be so, the fact is that, at the moment, there is absolutely nothing worth reporting happening at either OPPD's Ft. Calhoun or at NPPD's Cooper. Cooper Nuclear Station (above) in NPPD Press Photo. Click to enlarge. At the moment, both plants are officially in "Notification of Unusual Event" status, the lowest level of alert in the NRC ranking. Cooper Nuclear Station is at this moment operating at full power. Ft. Calhoun Station has been shut down for refueling since April, and remains in this status with offsite power available and diesels all either on standby or in spinning reserve. 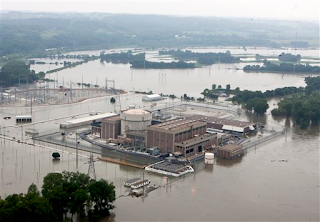 At Cooper, the plan is that if the flood water rises to 902 feet, the plant will be shut down. It appears now that this will not happen. Fort Calhoun Station; Press Photo courtesy OPPD. Click to enlarge. In a story published (where else?) at the Huffington Post, the chairman of the Sierra Club states that "our 104 reactors are anything but safe." This is of course based wholly on emotion, on environmentalism, and hatred of man and his technology and not on any fact - because, as we all know, there's no SAFER form of energy generation in the history of the US that can power anything almost anywhere. This uneducated statement alone is enough to make one discount the whole story. Which isn't a bad idea, frankly... considering these people's predictions that either Ft. Calhoun or else Cooper were the coming apocalypse. Some even said -- based on reports from Russia, of all places -- that accidents had already occurred. Ft. Calhoun and Cooper are not 'dodged bullet' events. They are examples of the success of defense-in-depth, of planning, of attention to detail, of ACTION. 10:00 PM UPDATE Our friend FINTAN DUNNE has posted an excellent and thorough look at the further threat of dam breaks upstream. These are worth examining and quantifying in a realistic way and his excellent article does just that. Click here to read Fintan's article on the threat of dam breakage. Labels: "cooper" "ft calhoun" "flood" "missouri river"
-TEPCO has begun injecting nitrogen into the dry well of the No. 2 plant. This is being done to eliminate the chances of radiolytic hydrogen accumulating and causing another explosion. Nitrogen injection has been performed at No. 1 plant more or less continuously since April 7 with a total of 54,200 m³ of nitrogen having been injected. 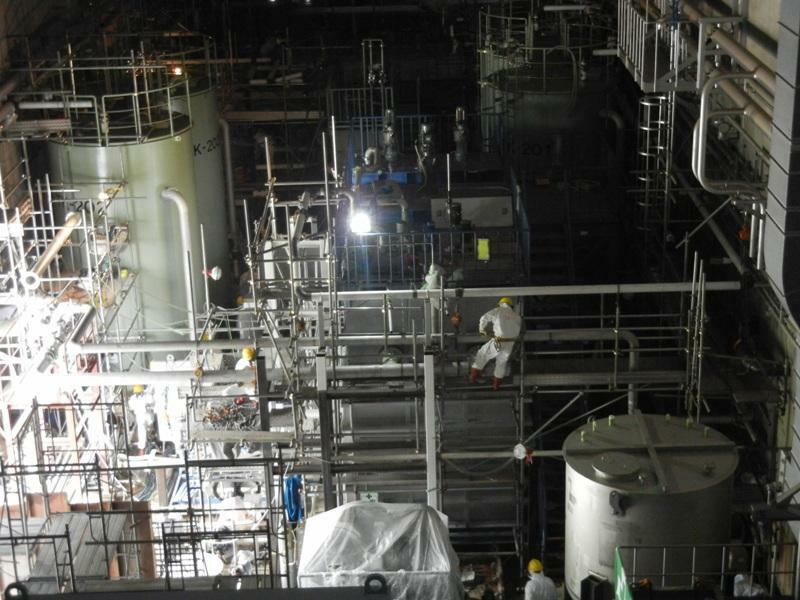 -TEPCO has fixed leaks in the connections between its decontamination system and the feed systems of No. 1, 2 and 3 plants and is now operating reactor cooling injection in RECIRCULATING mode. The flow path of the water is as follows: Water is taken from the Centralized Radioactive Waste Treatment Facility (where it's been, and is being, pumped from turbine buildings and pipe trenches) and pumped to TEPCO's decontamination system (Kurion/AREVA as contractors.) 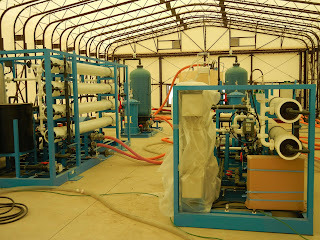 From this system the water is sent through a desalinization system, and is then pumped to a 5000 m³ treated water tank. From this tank water can be sent to any or all of three pumps that provide water, through long hoses and pipes, to the reactor feed systems for core cooling. 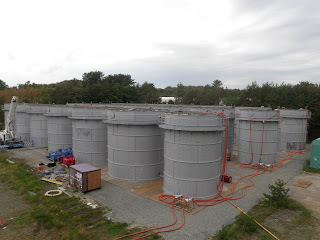 There are also two 8000 m³ filtrate tanks that can supply water to the system if necessary. At the moment, TEPCO indicates that water is going to the rad waste building from No. 2 and No. 3 plant turbine building basements. -Injection rates to No. 1 and No. 2 plants are both about 3.5 m³/hr with No. 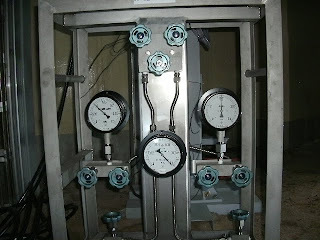 3 plant's injection rate at about 9.1 m³/hr. -TEPCO avoided, at its annual shareholder meeting, an attempt by shareholders to force the company to abandon nuclear energy. The measure was voted down. 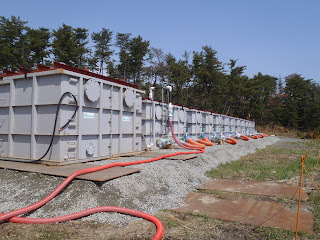 -TEPCO has, as was reported in some places, now used borated water into No. 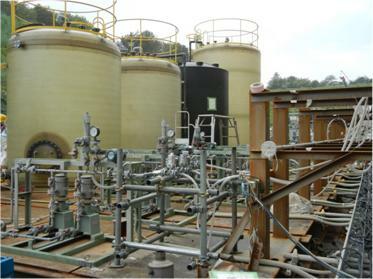 3 plant's spent fuel pool at Fukushima Daiichi. This is to correct the pH of the spent fuel pool, since borated water is on site and will accomplish this task to prevent rapid corrosion of the fuel elements in an alkaline environment. The pH of the pools is thought to have been disturbed by concrete debris in the pools. 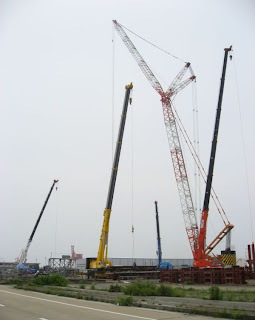 -A giant crane has been placed on site at Fukushima Daiichi to launch construction of the cover at No. 1 plant's reactor building. (See the APR YouTube Channel for videos about this covering.) 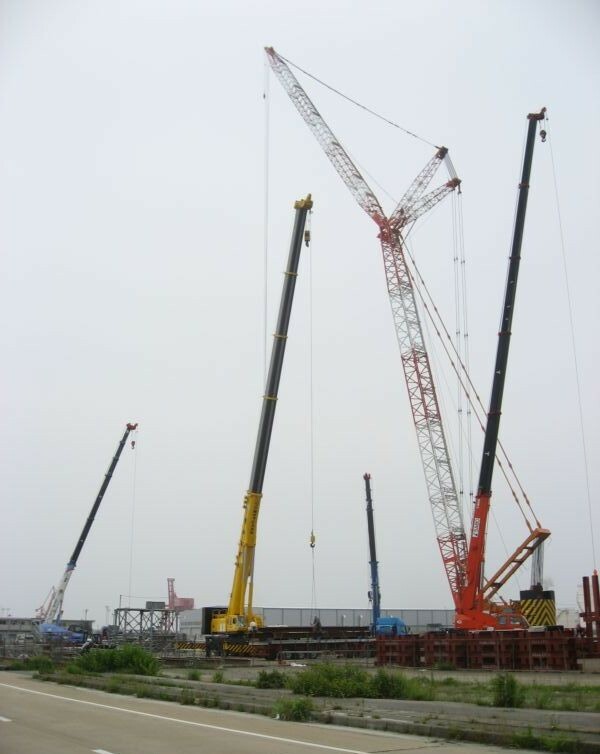 Sections are now being assembled at Onahama Port for shipment to Fukushima Daiichi. 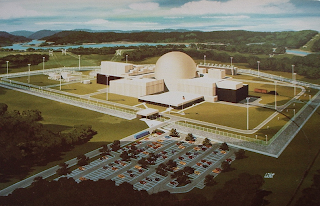 According to World Nuclear News, the company known as Generation mPower, on which APR has reported before and which is jointly owned by Babcock & Wilcox and Bechtel has signed a letter of intent with the Tennessee Valley Authority to build as many as six of its modular PWR plants, rated tentatively at 125 MWe, at a site formerly cleared for the long-abandoned Clinch River Breeder Reactor. 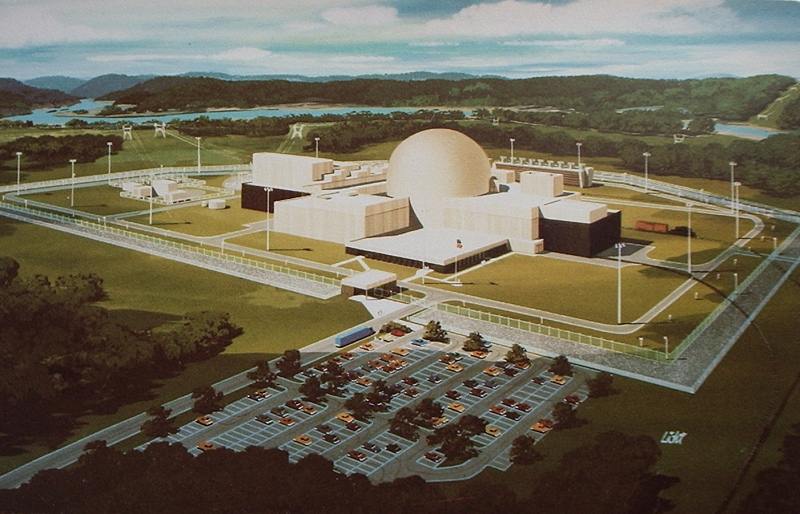 Above, illustration from APRA collection showing the final site layout for the Clinch River Breeder Reactor. 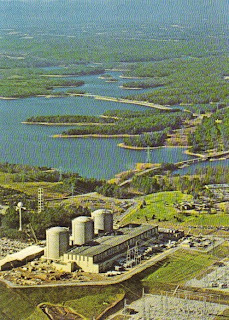 Post card view; credit on card is to Breeder Reactor Corporation. 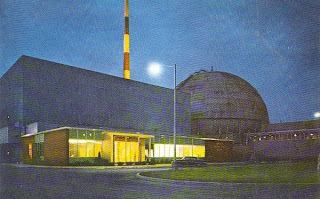 The CRBR project was begun in the late 1960's by the AEC to develop a breeder reactor that would also produce a useful amount of energy commercially, and built on experiences gained from the EBR series of reactors and Fermi-1 near Detroit. 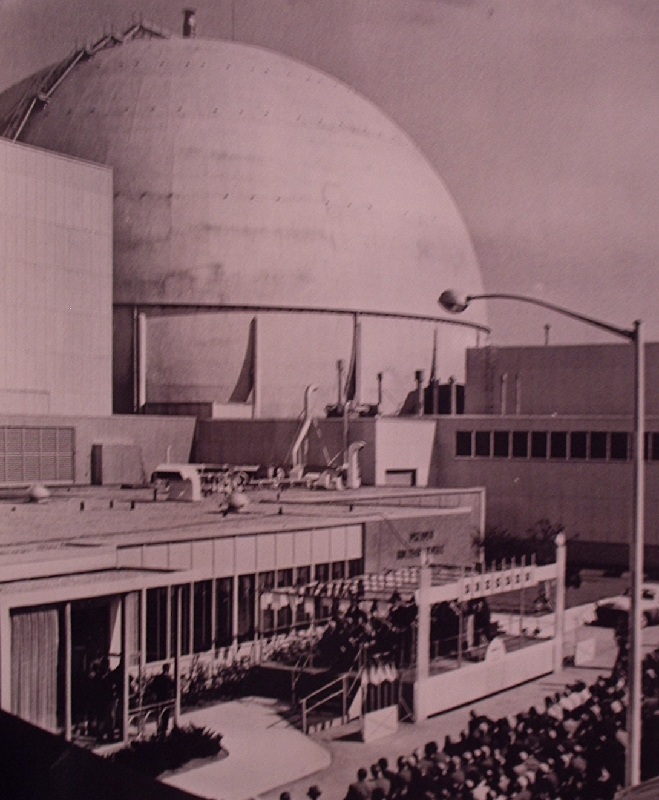 Initial investigations and requests for bid proposals are mentioned in the "Nuclear Industry - 1969" volume produced by the AEC and the project was formally initiated in 1970. The project dragged out through developmental, budgetary and licensing problems for many years and was finally the subject of a bruising Congressional fight that began the end of the days of the JCAE and which led to the cancellation of the project for good in 1983. The private sector companies involved in this project, Babcock & Wilcox, and Bechtel Corporation, are no strangers to those familiar with nuclear energy. Babcock & Wilcox was one of the four largest commercial reactor vendors, receiving its first commercial plant order for what became Indian Point 1 in 1955 and receiving the contract for the nuclear plant for the N.S. Savannah in 1956. 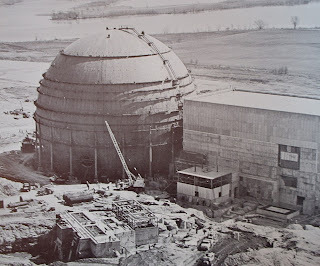 B&W then spent a number of years without receiving any further orders as a reactor vendor per se but continued to construct major components for many nuclear plants, especially pressure vessels. 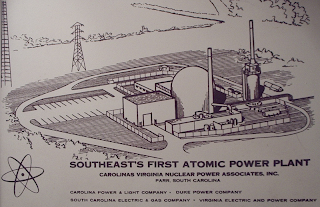 Finally, in 1966, during the first flood of nuclear plant orders, B&W received its first orders for what it termed at the time to be its "second generation" plant designs - the first being two units for Duke Power (these became Oconee 1 and 2) in July 1966 and then Met Ed's order for Three Mile Island 1 in November of that year. B&W's last orders for new plants were received in 1976; according to B&W's 1975 edition of STEAM, the company had sold 29 of its second-generation design plants and that 24 of them "were in the process of detailed design, fabrication, installation, testing, or operation." Five of these were at that time in commercial operation, with a sixth undergoing power escalation testing, according to this volume. 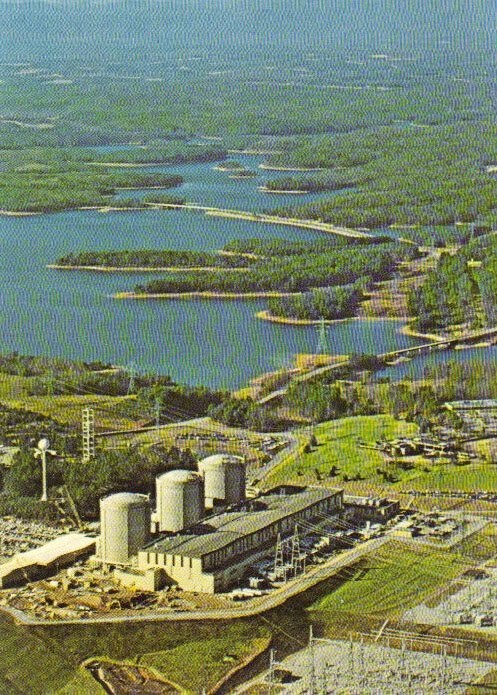 Above, from APRA collection - Oconee Nuclear Station, Seneca, South Carolina. Owned and operated by Duke Energy Carolinas, LLC. The first large order for Babcock & Wilcox, and the longest-operating site using B&W plants. Above, wire photo in APRA collection showing the Midland Nuclear Station in May, 1978. 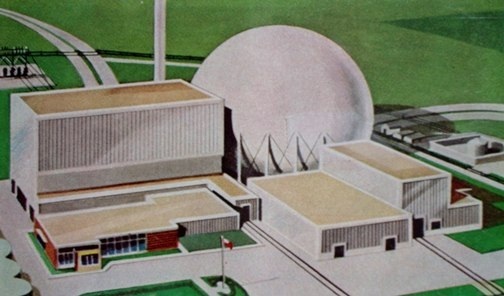 This two-reactor station, with B&W plants that were the first to be designed to provide both process steam (to Dow Chemical Corporation) and commercial electric power (Consumers Power Company) suffered massive problems with buildings settling unexpectedly, problems with reactor vessels and financial problems, finally being cancelled in 1984. Item: An unused reactor vessel head on this site was later shipped to Davis-Besse for use on that site's B&W plant. B&W, shortly after the TMI-2 accident, stopped offering for commercial sale any new reactor plants, so that this project through Generation mPower is its first as a reactor vendor in many years. The modular reactor concept isn't new to B&W either; it was shopping around a small compact NSSS in the late 60's which actually was built in modified form for use in the German nuclear ship Otto Hahn, and was built in Germany by a B&W license arrangement so that it is not wholly improper to say that B&W design plants powered 2/3 of the free world's commercial nuclear shipping... namely the NS Savannah, and the Otto Hahn. COMING IN PART 2: Some background on TVA. Labels: "mPower" "Bechtel" "TVA" "babcock"
TEPCO continues to reduce rates of water injection. Here are the injection rates, and feed nozzle / lower head temperatures at most recent update. At last report TEPCO calculated the buildup of roughly 400 tons of water per day due to the feed and bleed cooling. Work in No. 2 reactor building continues. Not only has the temporary RPV pressure gauge been installed but also the nitrogen purge line to the dry well is now in place. 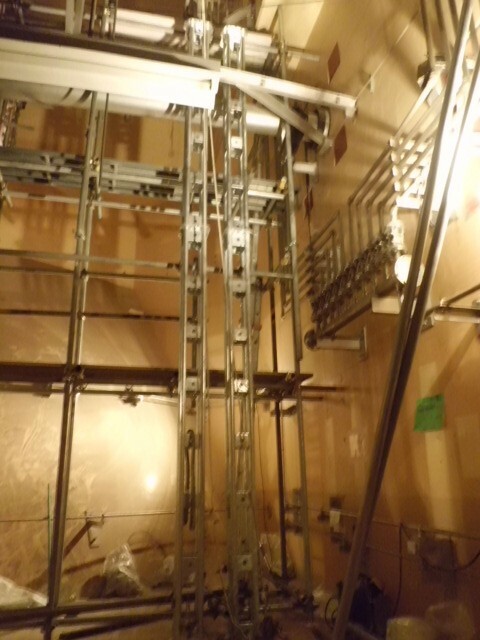 Below is a TEPCO press release photo showing the equipment rack where the temporary gauge is installed, and the tripod for the television camera that transmits a view of the gauge to the TEPCO headquarters on site. Also at No. 2 plant... The T-Hawk remote helicopter had an emergency, forced landing on the top of No. 2 plant's reactor building. 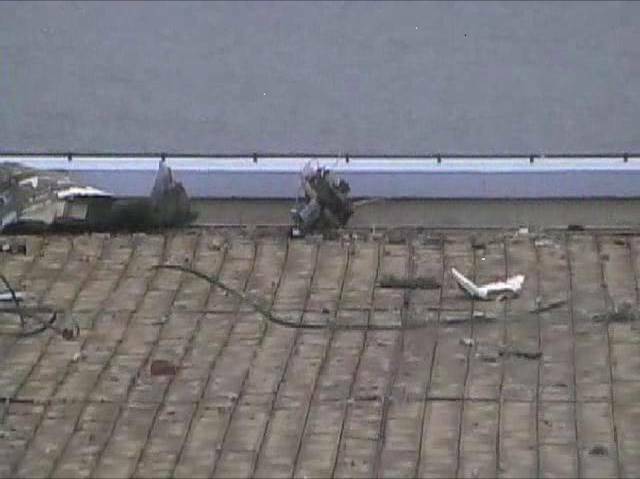 Below is a photo showing the helicopter sitting on the roof. The helicopter was being used to sample particulate matter at the opening in the side of No. 2 reactor building according to TEPCO. In a similar vein, TEPCO has sampled the air and any emissions above No. 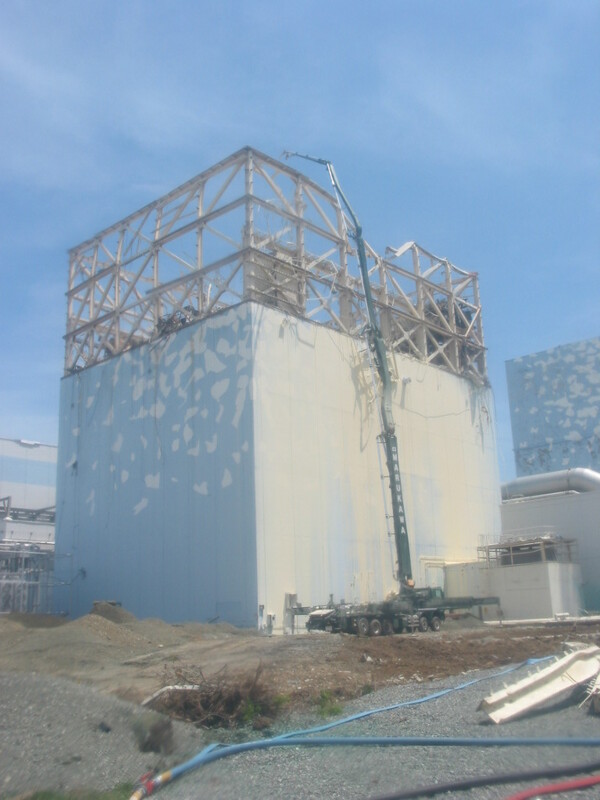 1 reactor building using a concrete pumper truck modified for the job; this operation on the 23rd is seen below in another TEPCO press photo. 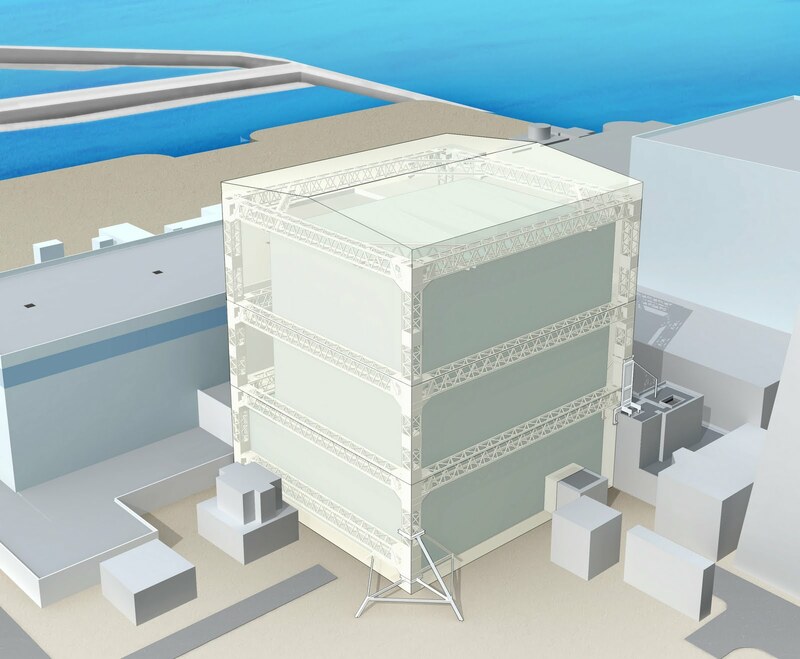 TEPCO continues rapidly to develop its plan to erect the first-style (as we are calling it here) containment structure, sometimes referred to as the 'fabric enclosure,' around No. 1 building and a few more details are now available. The steel structure will be supporting large sheets of fabric, now announced as being a polyester fiber fabric coated with vinyl chloride resin. This membrane will keep in any radioactive (or other) dust and gas, to be handled by an internal air filtration system capable of handling 40,000 m³/hr of air. The sheeting will of course keep out rain, snow and wind to allow the start of work inside. Much later on, a much more solid type of structure will be built at each reactor building when the preparations for defueling begin. 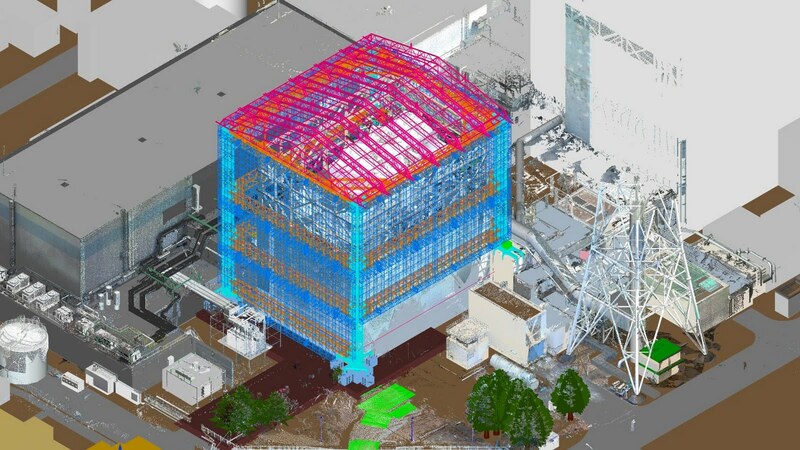 TEPCO expects this first fabric enclosure to be complete at No. 1 plant by the end of September. 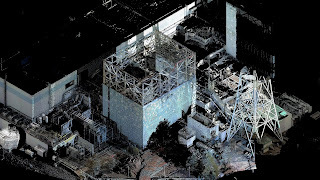 Make sure to look at the Atomic Power Review YouTube Channel (link at right of APR page) for the videos showing this structure in animation/CGI produced and released by TEPCO for the media. Note the tiny concentration of the short-lived I-131, and the high concentration of long-lived fission product isotopes. At the first take this seems quite out of proportion if spent fuel pool criticality had been achieved recently. At last report TEPCO calculated that its contaminated (on shore) water treatment system had processed ~2,489 tons of water. Problems with the system in terms of pre-operation valve lineups (throttling valve positions) seem to have been fixed so that the cesium adsorption portion of the system will now operate as planned. Meanwhile, TEPCO is working on desalination components in view to an end of completing the recycling of cooling water for the cores. These are the updates for now; I will be posting an article over the weekend covering some observations, and things we can expect, concerning the future recovery actions at the site. I am very proud to announce that I've participated in two interviews in the last week and that the results are now on line. The first interview was with Glenn Williams at The Street. Glenn and I talked at length about the recent JAIF-published compilation of public opinion polling about nuclear energy in Japan, and many other things at length as well. I probably learned much more from Glenn than he gleaned from my knowledge of what's going on in Japan; Glenn is a wonderful source of energy industry knowledge and I certainly look forward to speaking with him again in the future. The second interview was with that well known and most prominent proponent of nuclear energy, Rod Adams. I had been looking forward to talking with Rod since an early e-mail exchange, because Rod and I have a Navy background in common (although Rod is an Annapolis graduate, and I was an enlisted RO so that we do have different views of the same program.) Our discussion was thorough, Rod was a fantastic interviewer (and a great source of information during the interview instead of just having asked questions, I might add) and the result was, for this author, a real pleasure and certainly an honor. The interview itself is now available on Rod Adams' ATOMIC SHOW web page. I highly recommend looking at the archive as well; there is a ton of information there for the listening. Thanks again to Glenn Williams and to Rod Adams for the time they gave me, during which I asked questions as well. Labels: "rod adams" "glenn williams" "interview" "atomic show" "the street"
Our updates on Fukushima Daiichi have slowed, as the number of, and seriousness of, developments on site also slows. This continued reduction is of course reflective of two things; first, the continuous slow lowering of heat output of the remaining fuel, and second the extreme desire of TEPCO to reduce to an absolute minimum the amount of water being deposited in the reactor building basements by the feed and bleed cooling that the reactors are receiving now. This reduction in flow rate has not seen an increase in monitored temperatures. Below, the reliable temperatures for all three units, given as feed inlet nozzle temperature first followed by lower vessel head temperature. TEPCO continues to work vigorously to get these reactors off the feed and bleed cooling by installing what appears now to be an open loop design of cooling system, highly improvised, and on which we've reported before. This system would take a suction on water in the plant turbine building basements, purify and cool it, and then inject it to the reactors via the feed line (which at this point all three are using, and have been for some time.) To this end work continues to allow full access to the No. 2 and No. 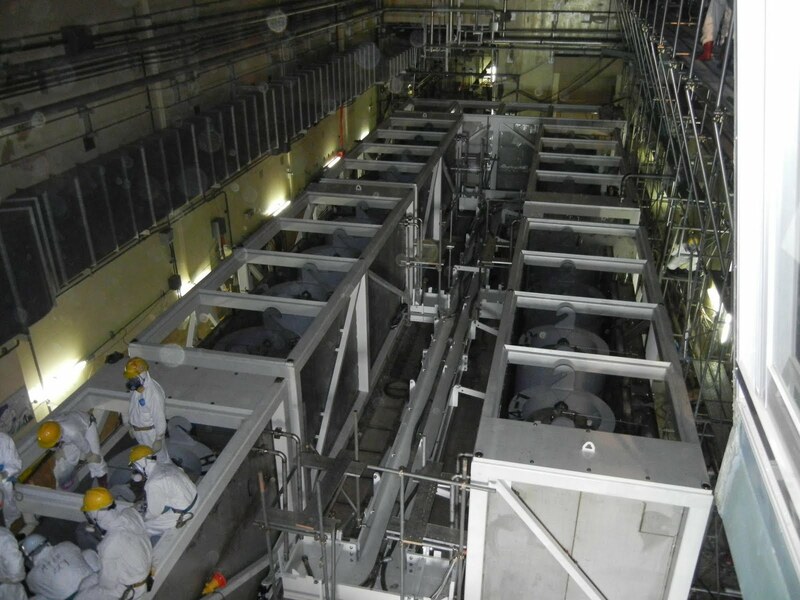 3 reactor buildings to not only perform inspection, but to install new pressure vessel indications (water level, pressure) and prepare for further cooling system work. This temporary gauge setup was installed at No. 1 plant, and its application seemed to confirm suspicion (in all quarters, frankly) that the pressure vessel was in better communication with the atmosphere than had previously been indicated by a failed instrument. The same type of instrument is now installed at No. 2 plant with remote TV signal being sent to the main operation center at the site, and we are awaiting the results after the setup is calibrated. I personally do not expect any surprising data to be revealed by this gauge setup - in other words, it will only serve to help confirm what we already suspect as at No. 1 plant. The radiation survey on the first and second floors at No. 2 plant is complete, and readings around the floor are generally as expected -- as is the dose received by the persons entering. The highest reading on the first level is about 60 mSv/hr and on the second, near the instrument rack, about 79 mSv/hr. (That's about 6000 mr/Hr and about 7900 mr/hr for those of us here in the States.) However, readings ramp up as one progresses down the stairs toward the basement. It would appear that either very brief runs were made to the foot of the stairs at two corners, or else (more likely) that instruments were dangled down to the foot of the stairs and two readings were made. These readings came out at 388 mSv/hr and 430 mSv/hr, which for us is 38.8 R/hr and 43 R/hr. As to the large and complicated Kurion/Areva water decontamination system: It must be remembered that this is not a factory-built system; it is a large assemblage of various components put together in ways that they SHOULD work to get the water cleaned up at the site. The major media outlets continue to report failures of this system, but they are all only temporary setbacks. For example, the latest official report of a system shutdown is involved with the overloading of a water pump, due to having too high a setting for recirculating flow. A valve adjustment was made to correct flow and bring pump load in line with its rating. This valve setting might well have been set roughly prior to operation, but fine tuning of any system is always needed and it's especially going to be so for such a system as TEPCO, Kurion and AREVA have set up here ... and the result is that continued full time, 'round the clock operation will only come with probably several more days of operating, finding weak points, and making fixes. It is the nature of the beast, one might say. The work we've shown here on No. 4 reactor building to strengthen the support for the spent fuel pool continues. Some readers wondered about the structure being built, using steel support girders; these are now being filled in completely with concrete, which will create essentially a massive steel-reinforced concrete monolith holding up the spent fuel pool. The concrete is already going in at this time. Also at No. 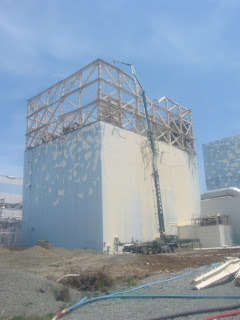 4 plant, TEPCO is refilling the well at the top of the building adjacent to the reactor vessel area and the spent fuel pool, because loss of some of the water in this pool had exposed radioactive components normally covered by water, driving up the dose rate seriously on the refueling floor. On-site installation of water storage tanks continues as mentioned before on this site, and which has been happening since June 8th. There is no hard figure at the moment of just how much capacity TEPCO has on site. We will have more updates later as needed. Labels: "fukushima daiichi" "tepco" "kurion" "areva"
While the rest of the world --- the part of the world NOT affected by the Great East Japan Earthquake, the resulting tsunami, and the Fukushima Daiichi Accident --- goes on as if it WERE the part of the world affected, it seems as if the Japanese are not as concerned and aren't as anti-nuclear as anyone would have suspected. The proof is found in a document released by the JAIF (Japan Atomic Industrial Forum) which is a major trade group, for those unfamiliar, for nuclear industry in Japan and which is modeled right off the old AIF (Atomic Industrial Forum) here in the United States. This information is important; we've already posted here in the past about public opinion in the United States after Three Mile Island, and this compilation of survey results is telling us essentially the same thing. Click here to see my post on the public opinion post-TMI. The more that the result of this survey compilation spreads, the better. Especially if it's in Germany and Italy. And Switzerland. Note: I've reposted this data to get it to the top of the site for the evening, and to add the link to the TMI post I made some time back because it's very relevant. Labels: "fukushima daiichi" "TMI" "public opinion" "survey"
The AP has produced a now widely-disseminated article covering supposed serious failures of the NRC, and implying a highly reduced level of safety of our nuclear generating plants in this country. The article is a masterpiece of shoddy journalism, mentions no names of actual analysts or nuclear experts, and is clearly based on misinterpretation of partial information. Naturally, the nuclear establishment has a right to respond, and it has. The Nuclear Regulatory Commission has responded: See here. Nuclear Engineering Institute has responded: See here. Also see the blog roll and link list on this site for various rebuttals of the article. Given the weight of the response, the AP article falls like a house of cards. As well it should. Labels: "associated press" "NRC" "NEI"
In one of our previous discussions concerning the nature of reactor plant containment, we made considerable effort to detail the very early history of the types of containment applied to boiling water reactors and gave a good deal of detail on that built at Morris, Illinois for Commonwealth Edison's Dresden Nuclear Power Station. Look here to see this previous post on Atomic Power Review. Did you know that the original design for this station was very different? It was. The original design, developed during an evolutionary process that lasted several years, was first revealed in late 1955 after GE and Commonwealth Edison announced the project officially in April 1955. 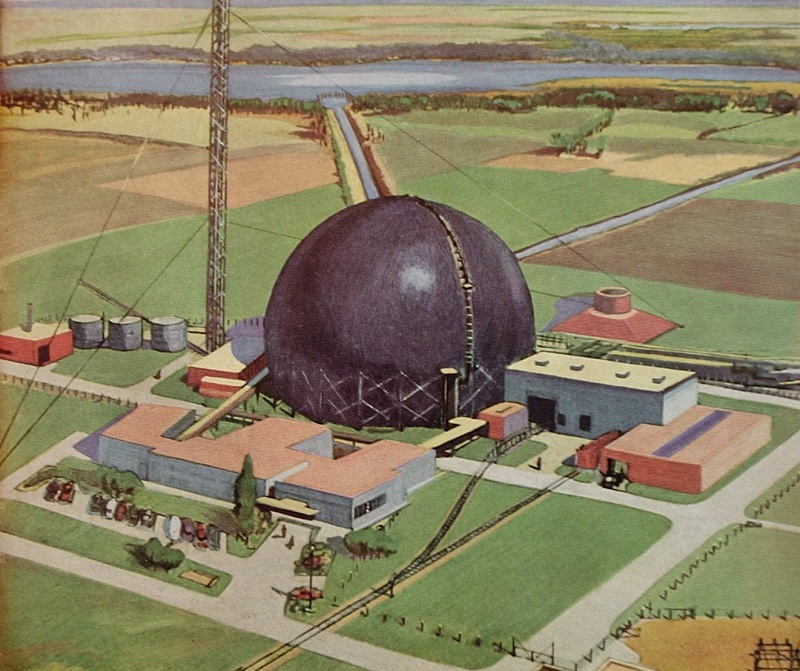 The original design for the Dresden Station included the construction of one very large 200 foot diameter steel sphere to contain not only the reactor, but the generating equipment and even the control room. 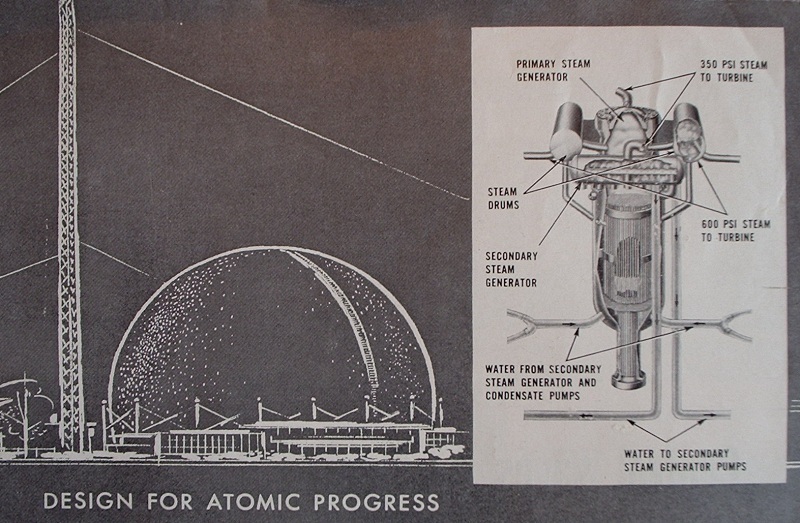 Let's look at some early illustrations from 1955 that show the plant's original conceptual design. Above, late 1955 GE official illustration showing the originally conceived layout for the Dresden Station. Note that there are only fairly small support buildings outside the large sphere. The next illustration shows why this is the case. 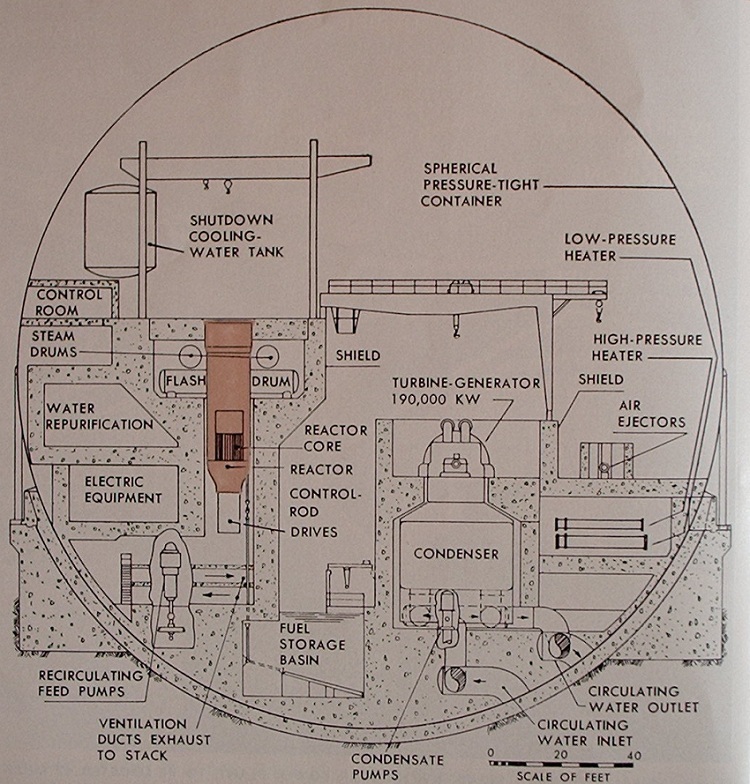 This remarkable cross section view (click to enlarge, as with all photos on this site) shows clearly that not only the reactor and its secondary loops but also the TG and control room are inside the sphere. 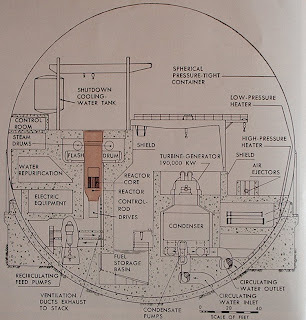 This is slightly reminiscent of the design actually constructed at Punta Higuera, Puerto Rico by General Nuclear Engineering (later, Combustion Engineering) for the BONUS nuclear superheated steam plant in that the generating equipment is inside the containment. Above, GE press photo showing two representatives and a scale model of the original configuration planned for Dresden Nuclear Generating Station. 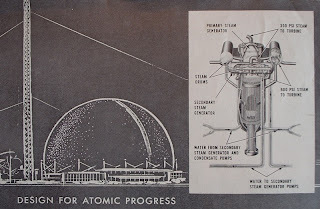 Here we see a more stylized late 50's art version of the plant, and a cutaway of the original design of the reactor pressure vessel, and the "flash tanks" that were to have been used to produce secondary steam in this original design. As we know, this design does not match that which was actually built. GE and the architect-engineer firm, Bechtel Corporation, moved not only the turbine generator but the control room outside of the containment. 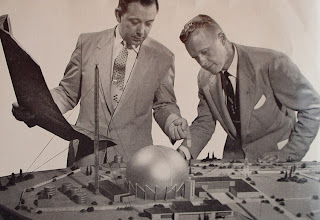 The giant sphere ended up being 190 feet in diameter, with the equator of the sphere 56 feet above plant grade level. According to the 1959 ASME volume "Nuclear Reactor Plant Data, Vol. 1; Power Reactors" the internal design pressure was 29.5 psig and a temperature of 250F. 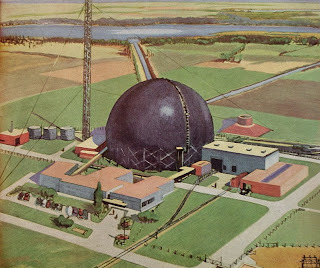 The sphere was reinforced against all external weather such as snow, ice and wind and was reinforced to withstand an external load of 1 psig. Thickness of the plates used to construct the sphere varied from 1.25 inches to 1.40 inches. Here we begin to look at Dresden Nuclear Generating Station (now known as Dresden-1 since two other plants were built on site later) as it was actually built. First is a Bechtel advertising illustration showing an artist's concept of the finalized design. Construction began March 1, 1957 with the heavy excavation and construction starting in June 1957. Below is a large and impressive photo of the plant while under construction. 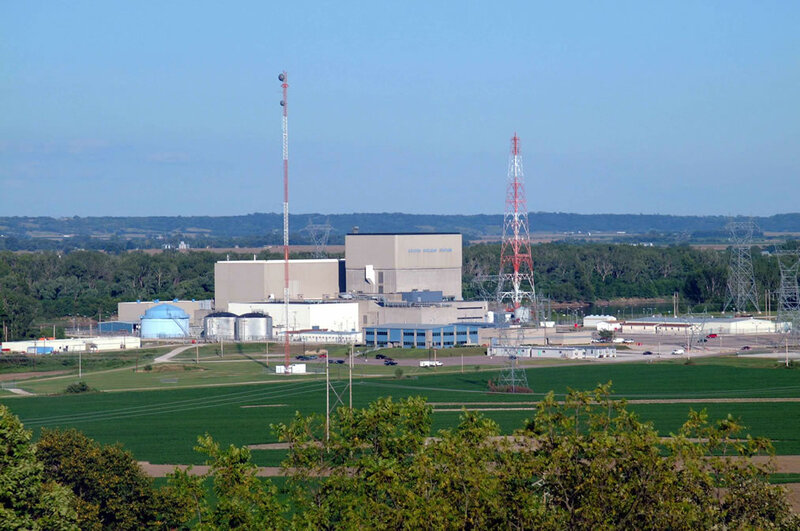 Dresden Nuclear Generating Station's reactor was first made critical in October, 1959 and achieved full rated power (626 MWt) in June, 1960. Below is a scene at the official dedication on October 13, 1960. Below, a nighttime shot of Dresden-1 after commissioning. A booklet covering the station is in the APRA collection; below is the cover. From the inside of the booklet is this illustration showing the plant layout as built. Note the very different configuration of the reactor plant, and the very high orientation of the steam drum above the reactor, with piping to and from it either side of the refueling hall. We'll be doing many more of these retrospective features in the future, with many different plants covered. Labels: "dresden" "boiling water reactor" "containment"
The JAIF has been pivotal in the presentation of realistic, timely information to the world at large concerning the Fukushima Daiichi accident situation and I commend them for presenting this document in the face of the current situation. It is well worth reading, and discussing, on both sides of the issue. 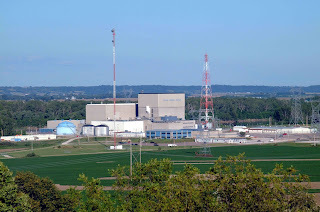 This is a very brief post to let APR's readers know that I've added the Omaha Public Power District's Storm and Flood / Outage Blog to the "Nuclear Blog Newswire" blog roll on the right side of the APR page here. Readers can now look simply to this blog roll for the latest OPPD updates on the flood, and on the situation at the Ft. Calhoun station. Labels: "ft calhoun" "oppd" "flood"
Note: I am keeping track of the situation at the Ft. Calhoun station in the USA, which is in the midst of a flood of the Missouri River and which is getting no small amount of press on the anti-nuclear media front. However, the situation at the station is from all official and reliable sources not dangerous at this time, does not now and never did constitute any sort of accident and there is no danger to any fuel on site at the present time. The situation will be detailed here if and when necessary. Click here for official information, for now... and thanks to the ANS Social Media List's members for alerting me to this OPPD page. Fukushima Daiichi I have had a chance to review some official documents from TEPCO and NISA, and one of the points of the accident sequence that has been the source of some conjecture can be clarified as of now. It appears that the isolation condenser system at No. 1 plant was manually shut down prior to the onset of the tsunami, upon reaching a cooldown limit. This cooldown limit is 55C/hr or 131F/hr. Upon reaching this limit, operators secured the IC system per operating instructions. At this moment, it does appear that the operators were unaware of the approach of the tsunami, given some other reports (IAEA being one source) that indicate that while many thousands of citizens were made aware of the tsunami's likelihood by automated warnings on TV and radio, the plant operators had no such warning available. This latter point is still not confirmed absolutely, but the timing of the shutdown of the IC system at No. 1 plant seems pretty firm now. We might then suspect that operators had no reason to think that they would lose all offsite power and all diesel power from on site... given that they probably did not know the location of the earthquake epicenter (off shore), and therefore could not realistically be expected to predict that there would be a tsunami. We will surely see much more official, and unofficial, commentary on these two things -- namely, the shutdown of the IC system, and the entire nature of the notification of, and/or knowledge of, any tsunami at the site. Having said that I might point out that the operators would in all probability NOT have suspected that any tsunami they DID suspect was coming would overrun the plant's defenses against this sort of thing, given the known "worst case" design basis for the plant's tsunami defense. Why all the conjecture about impending tsunami knowledge on site? Because this leads to the direction of actions on site, if one suspects he will very soon lose AC power, all heavy rotating electric machinery, and a great deal of (or all of) his I&C equipment. This very point might be pivotal in saying something like "yes, we've hit a cooldown limit on the RPV but we're about to lose all power and get hit with a wall of water so leave it run and to hell with the cooldown limit if we won't be able to start it again" .. or some such supposed, similar, thought process. The deepness of just what the accident investigation will reveal might now be a bit clearer to those outside the loop, as it were, as we see the interplay between system and equipment operating limits, operational abilities with equipment deranged and probable knowledge thereof, and any effects on decision making vis a vis those two things made by knowledge of, or lack of knowledge of, a further impending natural disaster. Having now gotten one of the first known critical questions in the accident sequence at least briefed for the first time in good detail, we can proceed to an update of the site conditions. I decided not to update last evening because a number of conflicting reports were being made about the water purification system on site, which is a combo of components supplied both by Kurion and Areva. It seems that some leaks occurred, so that the system was tested and then shut down (introduce wave of "oh no" posts on anti-nuclear blogs) followed by more testing which went well until one component in the system reached a total radiation flux exposure limit, at which point operations were again shut down while a replacement part was found and also while it was determined whether or not the dose rate on this component was actually valid. As such, then, there have been a number of rapid status changes regarding the system and as of now it appears to be temporarily suspended while components are replaced. The seawater purification system, acting on that body of water contained inside the silt fence which surrounds the water inlets of Nos. 1 through 4 plants, is now in operation. 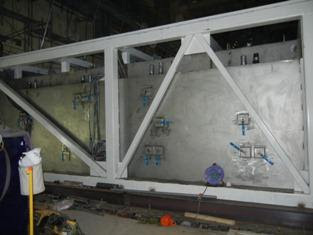 TEPCO continues to install the support beams, shown on this site a while back, below the spent fuel pool of No. 4 plant. It has come to our attention via the ANS Social Media list that one purported expert is running about claiming that there are 20 total cores in danger on the Fukushima Daiichi site. Nonsense. Each of the plants, No. 1 through No. 3 contains one core in the plant. For No. 1 plant, that is 400 fuel elements, for No. 2 and No. 3 that is 548 fuel elements. The number of fuel elements in each plant's spent fuel pools in order of plant number is 292, 587 and 514 or we could say maybe three more cores worth, being very generous. No. 4 plant's core was removed, and there are 1331 fuel elements in No. 4 plant's spent fuel pool or roughly 2.5 cores worth. Thus, at the damaged plant buildings there is a (generous) total of about 8.5 core loads worth of fuel elements. These are the facts, not suppositions. Conditions at No. 5 and No. 6 plant on the site are not of any dangerous nature. Their fuel element total is irrelevant, as is the total at the not too distant Fukushima Daini generating station, which is also in no danger. Fresh water and hydrazine continue to be injected to the spent fuel pools as is needed. As noted before, the hydrazine is a corrosion inhibitor. In a related note, Banri Kaeda, the Minister of Economy and Industry has requested that the local authorities all around Japan restart the nuclear plants in their jurisdictions, having ensured them that the added inspections and quake / tsunami provisions required by the government have been met. Japan will be seriously short of energy if all of the shut down plants remain shut down; however, public opinion seems to be bad for nuclear at the moment given the public displeasure of the Japanese government's handling of the situation and the feeling that the government didn't tell the truth about nuclear plant safety in the past. I would expect some plants to start up, and others not to -- on a case by case basis. Not right away, anyway. Finally, an APR YouTube Channel note: I have marked as a "favorite" the IAEA inspection team tour video at Fukushima Daiichi, so that it's visible right from the APR YouTube page linked from Atomic Power Review's side bar. This video is not stunningly revelatory, but given the dearth of real-time, personal level onsite footage it is worth seeing. Labels: "calhoun", "ft calhoun", "fukushima daiichi", "NISA", "TEPCO"
Thanks to ANS Nuclear Cafe for hosting this week's Carnival of Nuclear Bloggers. The success of the blog you are now reading is only one proof that the internet, and the still-newish social media form known as the "blog" can be sources of solid technical and historical information, particularly when a subject whose details are so irreversibly technical as are those of nuclear energy. However, this blog.. and others like it linked from it.. are not the norm in their bias by far. This does not only the nuclear industry, but the country as a whole, a disservice. The speed at which information travels on the internet is exceeded only by the speed at which misinformation travels on it. Just a few days ago, a compressed video showing an hour's worth of the Fukuichi Live Camera at the Fukushima Daiichi site, and which clearly shows a fog bank rolling in to the site, was widely circulated on anti-nuclear sites and deliberately mislabeled as having depicted some sort of explosion on the site. While this blog was (as far as I know) the first to make note of this, albeit in the 'comments' section of the then- most recent post, and refute the claim that this was an explosion, the much higher propensity of people to seek out anti-nuclear sites for information seems to have temporarily overrun any real effort on the part of the public to discover what had actually been depicted. High page views on this site (and a major spike in the APR YouTube Channel, and which carried a comment on the video but did not reproduce it) indicate that many did in fact eventually seek out an educated and informed point of view, and as of this moment the "Fukushima Explosion Video" flap seems to have been put to bed. This spread of information is sort of a first-level attack against proponents of nuclear energy, if you will; while much of the traffic all over the internet concerning this 'event' was probably just people trying to find out what had happened (and which were being referred around direct linked anti-nuclear sites once finding one of them) the effect overall wasn't being pushed or directed, it seems, by any one person, site or group. However, recently this author discovered himself in a sort of second-level event in which he was prevented from making further comments on an anti-nuclear site, which constitutes a real, and active, anti-nuclear attempt to squash information. To be brief, the site "ProPublica.org" ran a story about Fort Calhoun which was so riddled with misinformation, and written so clearly anti-nuclear (using all the old tricks our friend Fintan Dunne points out so well) that I was forced to comment. I took issues with a number of things, but the most glaring to me was the fact that the anti-nuclear crowd could not even get the actual reactor vendor's identity correct. For those unfamiliar, reactor vendor = the company which designed and built the reactor and primary plant. You'd think that would be easy. Try the NRC site, or WNA's Reactor Database. After making one post, I was prevented from posting again at all -- all my attempts to simply give these people the FACTS were stopped. Note to you over there at ProPublica dot org: That plant is STILL a Combustion Engineering plant, and not a Westinghouse plant. We all know who ended up with CE's nuclear business. When the plant was built, they were COMPETITORS. But you'll ignore this and go back to writing things like "Nuke Plant Threatened By, And Threatening Contamination Of, Missouri River" and "Could Ft. Calhoun be the next TMI/Chernobyl/Fukushima/Krakatoa/Nameless Asteroid That Killed The Dinosaurs?" Further working against us, as a third level of assault, is that cadre of both former and newly self-appointed experts who spew anti-nuclear vitriol to anyone who will pay them to stand at a podium or in front of a camera. Academic types, with long hair and who are Asian, seem to be high on this list. Others, disgruntled former nuclear industry execs, and perhaps some "Access Terminated After Failing Readiness For Duty Test" types too, also fill out the TV / radio / newspaper articles with such stupidity as the recent assertion that there was prompt criticality achieved in Fukushima Daiichi's spent fuel pools. That's one of the dumbest things I've ever read. No, really. It really is one of the dumbest things I've ever read. Not just criticality -- but PROMPT criticality. There has been so much MISinformation printed and televised and radio-waved about Fukushima Daiichi that many of us don't even know where to begin to tackle it all; we take the anti-nuclear horsefeathers as they come, but whenever you clean up a pile of them here comes another. Can we even think about backing up far enough to ask the simple question "What's the problem here?" Sure we can. It seems to this author that the repetition of misinformation -- some of it old, from any given newspaper's file stories -- is perhaps because, for a number of reasons, nuclear energy has largely dropped off the radar screen of public awareness. We tend not to have any type of continuity of information about nuclear energy -- its history, and development in general in this country, or even local development. It's not in our educational system, it's not in the papers or the Saturday Evening Post or on TV because there's no continuing progress. It's telling when the public has much better knowledge about and is more conversant with the theory of global warming, and various associated theorized mechanisms for altering / worsening / improving its effects, than it is knowledgeable about or conversant with nuclear energy which has been an established technology in this country for over half a century. It's especially telling when we see that people with nuclear backgrounds will explain matters and entertain criticism, whereas those who advance the cause of global warming most avidly are the climate scientists who tell us that no one but climate scientists can really judge whether global warming is a fact or not. For whatever reason, the public trusts those who cannot provide proof about their position over those who can provide concrete facts. There was indeed a time when there WAS a continuity of information, of sorts, about nuclear energy. Press releases were made about very many events such as contract awards, groundbreaking ceremonies, reactor plant startups, first generation on the grid and so forth. 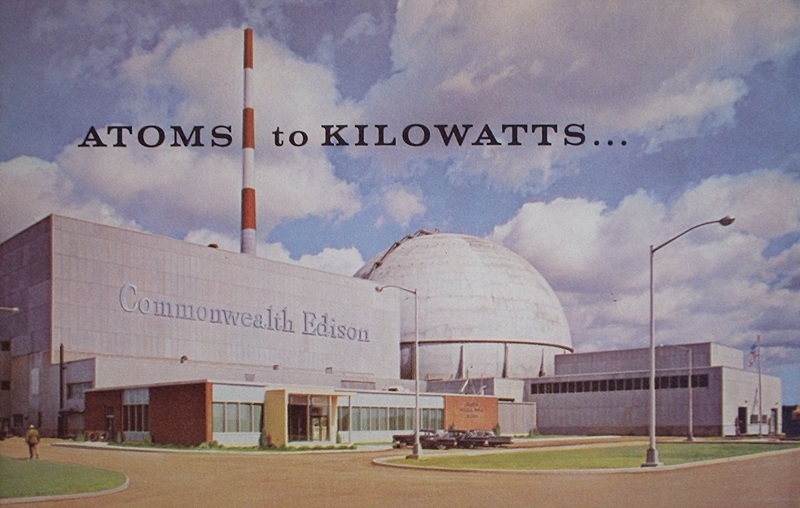 Utility companies, both publicly owned (fewer in number, contrary to popular belief) and privately owned formed consortiums with no small amount of press to construct pilot or experimental plants together to help defray the plant cost (in the AEC Power Demonstration Reactor Program, the AEC bore part of the expense too) and develop operating experience in concert with the reactor vendor and the AEC. All this was publicized widely, in many ways. Above, commemorative tray in APRA collection. This detail shot shows the CVTR or Carolinas-Virginia Tube Reactor, a heavy water moderated and cooled reactor built at Parr Shoals SC under the Atomic Energy Commission's 3rd round of the Power Demonstration Reactor Program. 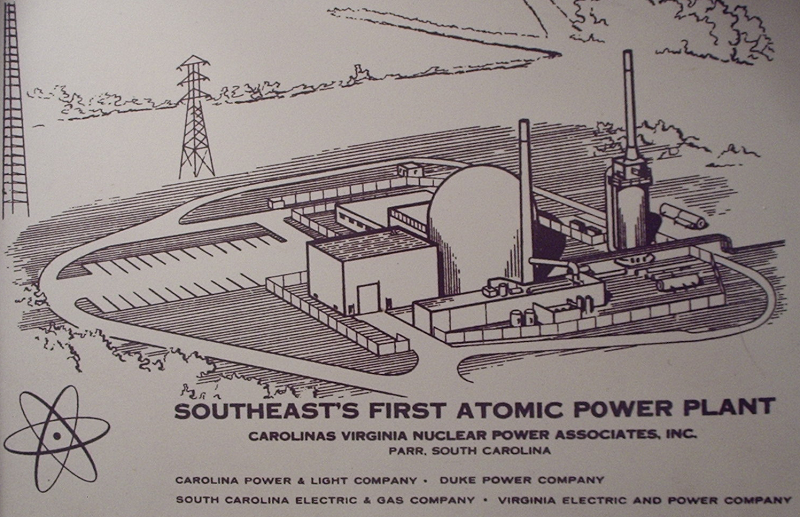 Carolinas-Virginia Nuclear Power Associates, Inc. was a partnership of Carolina Power & Light, Duke Power, South Carolina Electric & Gas, and Virginia Electric and Power Company. 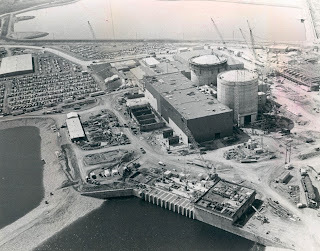 All of these companies later ordered conventional (and much larger) light water nuclear plants after gaining experience together on this project. Our point here is that persons reading about one of these later plants might also have read in a local paper something along the lines of "this plant is being built with several years' experience in the joint operation of the CVTR plant at Parr Shoals, SC behind the company." The reader might then have said "Oh, you know, I do recall the news about that plant a few years ago .. there were a number of stories about it" and this would then give the reader the perception - correctly so - that the new plants would be built, operated and managed standing on the shoulders of the previous experience. It is this sort of thing that I mean by continuity. Of course, the last paragraph's opening statement is true only if you consider the big media. As pointed out at the beginning of this post, the new media -- blogs, and YouTube too but mostly blogs -- are fighting the fight FOR nuclear power, right out on the front lines. The front lines of information are now the internet, and it's actually a lot harder, if you think about it, for the anti-nuclear crowd to get away with its old game. The big city newspapers and glossy-print newsstand magazines don't have the ability to get responsive comments out to all the readers instantly like blogs and online news sites do. While this gets their anti-nuclear message out faster and wider, it also allows instantaneous damage control by the pro-nuclear crowd (until their comments are banned, in which case the offending site will probably get called out for this on a really popular pro-nuclear blog.) This one fact may show that the pro-nuclear writers have a really good weapon, which is fact, and a good target to hit, which is the comment section of misleading, or just plain wrong, news items and blog entries. That right there is the answer to "What's the problem?" and to "What do we do about it?" We fight to get the facts out. Very luckily for us, there are a number of pro-nuclear folks who are very heavily involved in this area; they're mostly linked over on the right of the Atomic Power Review home page. Further, many of these folks are united in a project that will launch sometime soon with the direct purpose of undoing one of the problems I've noted above -- the lack of nuclear literacy, as it were, in the US public. It may even penetrate the educational system -- if we are lucky. Right now, we have as many answers to "What do we do about the level of knowledge concerning nuclear energy" in the US as we do to "What were all the failures, errors and issues at Fukushima Daiichi?" All of this is new, and both are playing out at the same time. The nuclear renaissance in this country is riding and falling with the tide of information, and misinformation, surrounding the accident and the US nuclear establishment's response to it. Hopefully with this post I've cleared away a bit of the fog surrounding the information issue so that we can move forward. If the journalists at large have truth in focus, rather than sales, they'll take note of what I've written here. If not, they'll continue using the same play book .. and we'll call them on it wherever we see it. NOTE: FUKUSHIMA DAIICHI UPDATE TO FOLLOW SATURDAY. 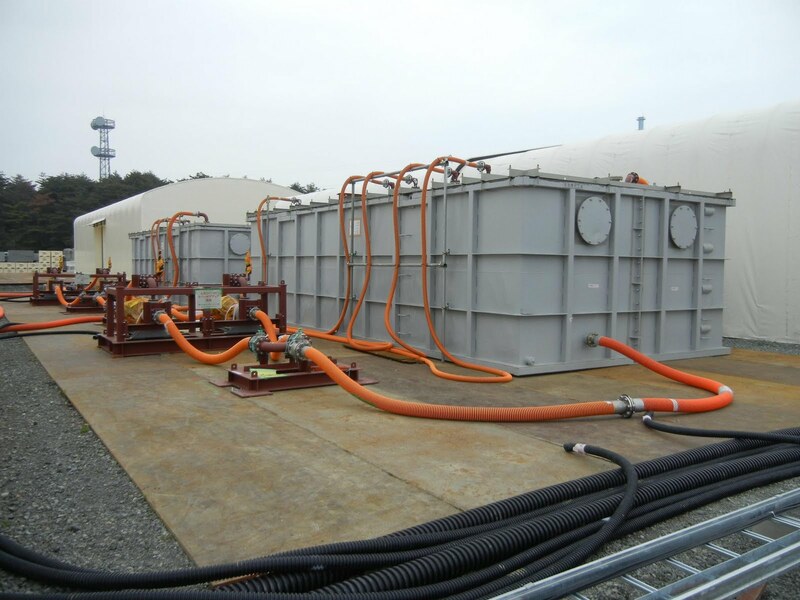 TEPCO has begun operations with the previously mentioned system to remove contaminants from the seawater which is inside the breakwalls, and silt fences, in order to help prevent spread to the outer waters. 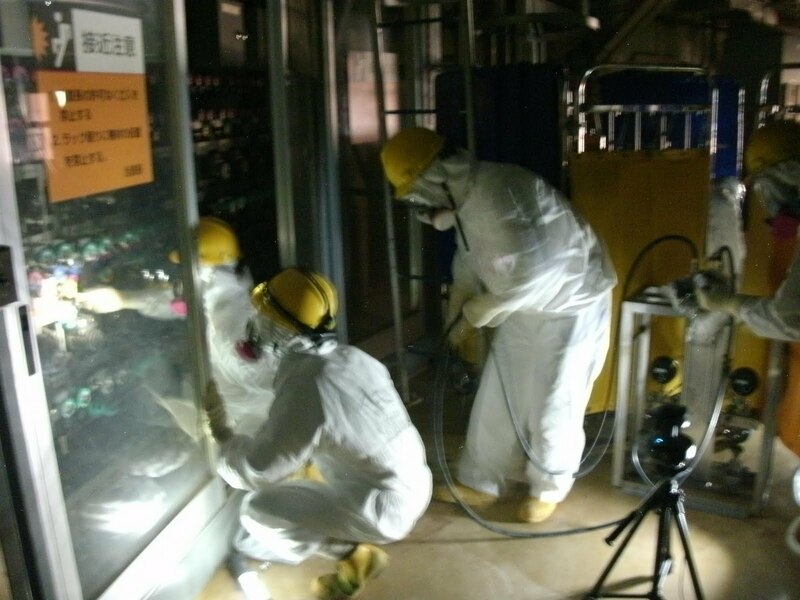 TEPCO has also begun intermittent operation of the first system set up to decontaminate water in the various onsite buildings. Various parts of this system, pictured previously on this site, are being tested separately and then in conjunction, first using plain water and then using low-level contaminated water. TEPCO's plan indicates that the whole system is to be in operation decontaminating water by the 18th of June, if all goes as planned. This system, contracted to Kurion, is only the first; the larger and more capable system contracted to AREVA has not yet begun construction. Contaminated water is being pumped from No. 3 reactor building to the rad waste storage facility as this is written. This is part of the ongoing general move to get access to the turbine buildings at all three affected plants in order to restore cooling. Water injection to the reactor cores at all three affected plants continues essentially as before, using the feed lines and at roughly the same rates. However, temperature on the No. 3 plant, which had been rising steadily, has now begun to decrease again with the most recent pressure vessel lower head temperature reading we have being about 161C which is ten degrees or so lower than when we last updated on this site. 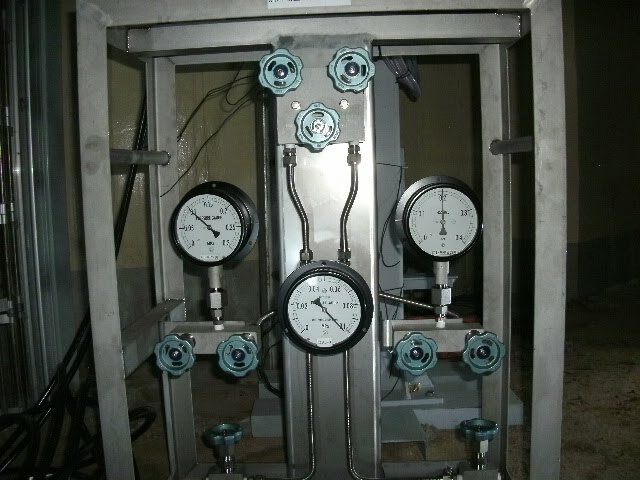 Water injection at this plant is actually down very slightly to 11.2 cubic meters per hour at last measurement. In the interest of completeness, as we've detailed before, work continues at No. 2 and No. 3 plants to gain access to the reactor buildings to install new water level and pressure gauges, and to allow for nitrogen injection to the dry wells. To this end the atmospheric work at No. 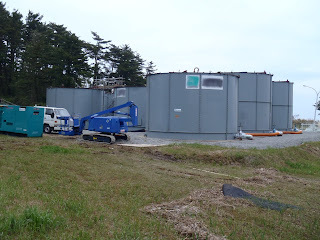 2 continues, while just recently TEPCO used a concrete pump truck to extend a sampling probe over the No. 3 plant's reactor building. TEPCO press photo of this operation is below. According to TEPCO, today a remote helicopter was used to conduct further detailed surveys around the No. 1 reactor building as serious preparation work is now underway to construct the temporary contamination shield cover for this building. This is the first of two different types of enclosures that will eventually cover all of the reactor buildings on site; first, this temporary style and later a much sturdier and heavier type which will be that which encloses the buildings while the reactors are opened and defueled. The preparation for installation of these first style enclosures is fairly elaborate. In addition to surveys on the ground, TEPCO has, as mentioned, used air surveys and laser imaging to obtain exact dimensions. 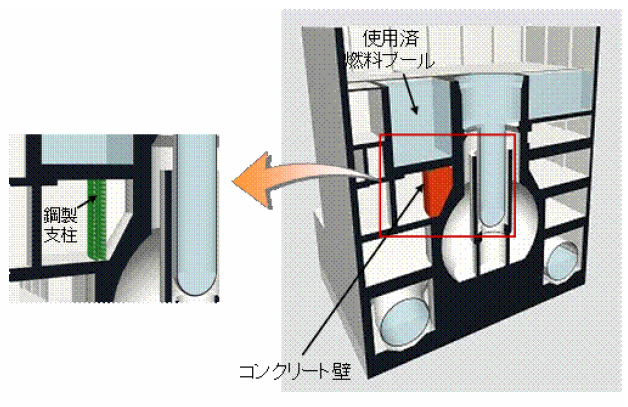 Here are two images showing steps in the laser imaging and dimensioning process, from TEPCO press releases. Both show No. 1 reactor building. Above is an external view of the reactor building of No. 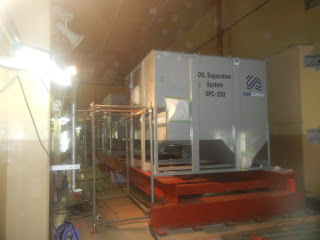 1 plant as it is now, and below is an image with the new enclosure added. Click both to enlarge. 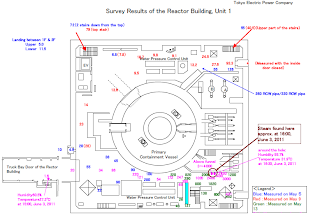 Below is a VERY large image (when clicked) of the reactor building enclosure, which is exceedingly well detailed and worth close examination. 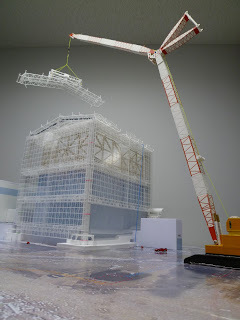 Below is a scale model TEPCO and its contractors have developed of the reactor building first style enclosure. Again, courtesy TEPCO. 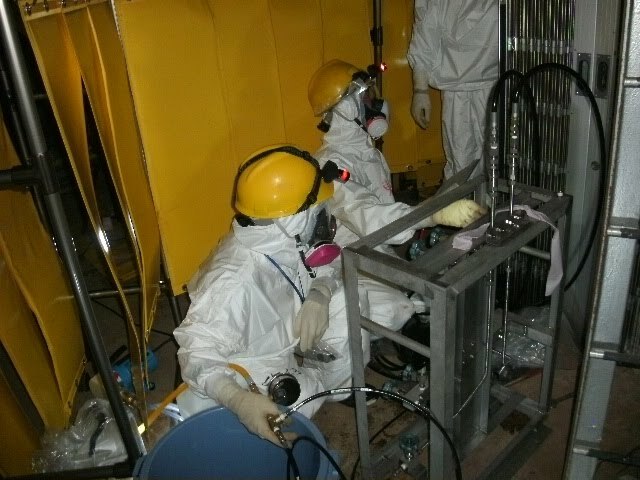 And finally we have a TEPCO press photo of an actual reactor building enclosure being test assembled at Onahama port, in practice for installation at the Fukushima Daiichi site. 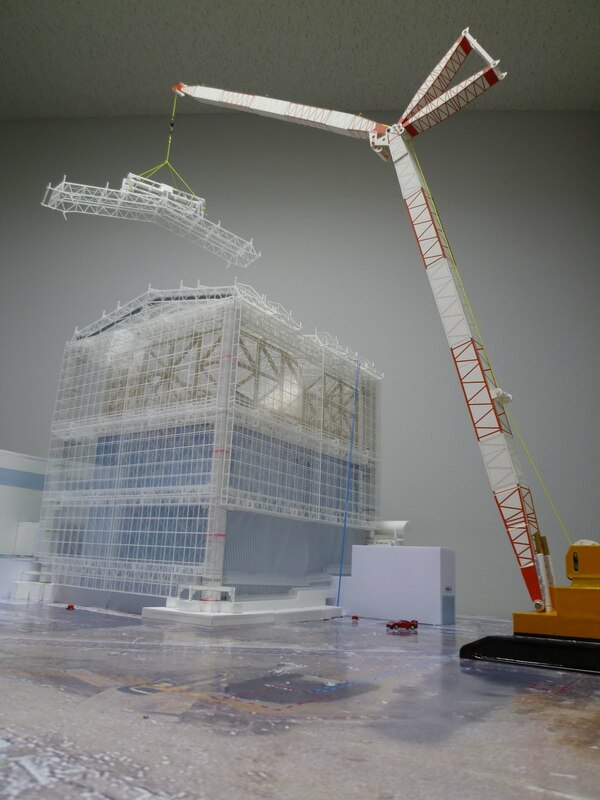 Shortly at the Atomic Power Review YouTube Channel we will have some TEPCO press release videos showing the survey and construction process for the erection of these first-style reactor building enclosures. Click here to see the APR YouTube Channel. 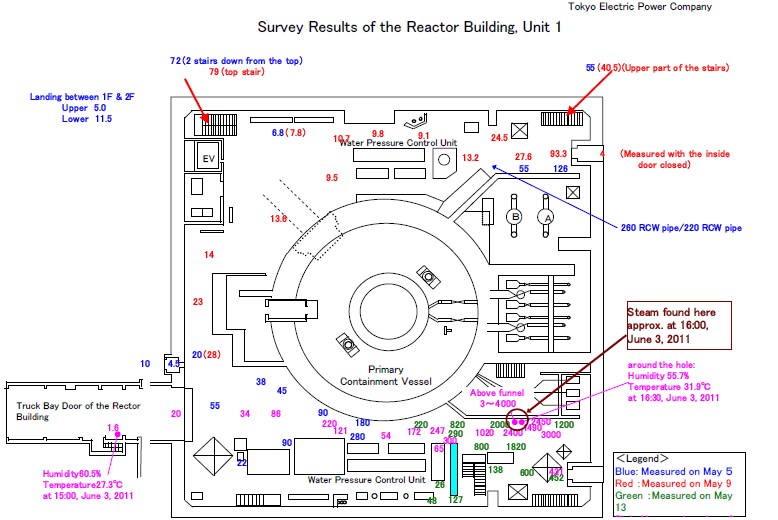 UPDATE: Just added this morning is a new TEPCO video showing the radiation survey work inside No. 3 reactor building on June 9th. Look at the APR YouTube channel now to see it. Link above, and always in red on the right of APR's page. It has been three months since the Great East Japan Earthquake today. Also, then, as a result three months since the initiation of the Fukushima Daiichi Accident by the tsunami which resulted from the earthquake and which inundated the site. The tsunami then caused what in many quarters is recognized now as the classic long-term SBO event but extended to a point not previously imagined without either AC or DC power on site, and with further equipment derangement than generally imagined due to the tsunami waters which overran what had been assumed to be worst-case-preventive defenses. Accident recovery has been hampered by the hydrogen explosions in the reactor buildings, which from the explosion in No. 1 building led to many further site complications due to debris from one plant interfering with actions at other plants, thus causing a complicated interrelation of cause and effect sequence and decision making not perceived as probable in design basis accident analysis. While many of the events on site have actually been exactly predicted -- even down to roughly the hour or two hour event times -- by previous accident analysis studies (mostly under the auspices of Oak Ridge National Laboratory) many of the complicating factors were not. Just as TMI-2 led to a re-evaluation of how many seemingly unrelated existing flaws both in personnel and equipment can lead to an accident that essentially fills a DBA scenario without being a classic DBA event, so now does Fukushima Daiichi cause the nuclear industry to widen its scope particularly and thoroughly on multi-reactor nuclear generating sites where the reactor plants are closely spaced, or worse, immediately adjacent. This is not by any means the sole area to be studied, but it fairly jumps out at the investigator at even the most cursory examination. With that, here are the most recent details from Fukushima Daiichi. 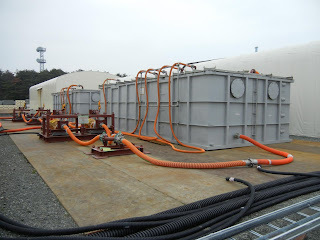 TEPCO is now testing its large water purification facility, assembled over the last week or so. TEPCO still intends to have this equipment functioning within the next week. Water injection rates to the reactor plants remain unchanged. Temperatures at No. 1 and No. 2 plants are stable, but No. 3 continues to drift upward, with bottom vessel head temp at last report being 189.2C (372.6 F). 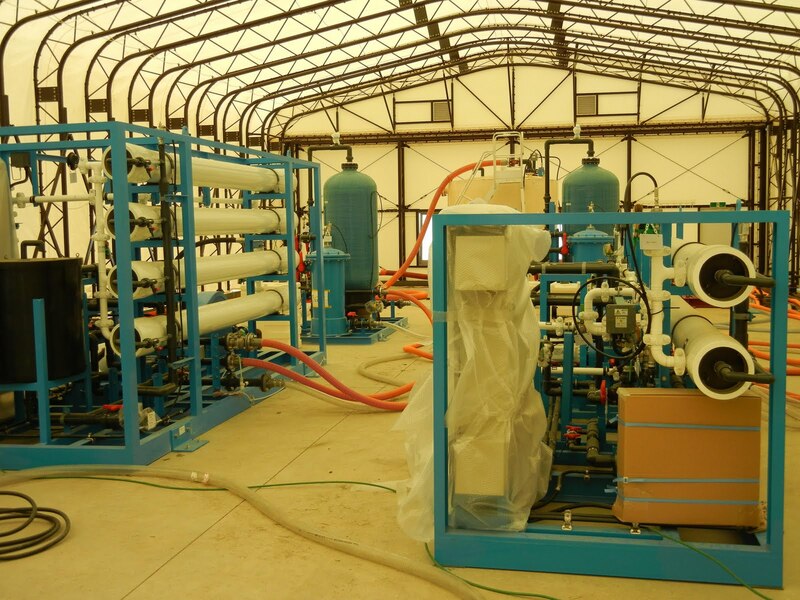 Next, water treatment equipment in No. 4 reactor building. 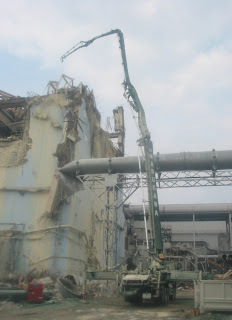 The damage seen above is considered by TEPCO to be serious enough to hinder its attempts to restore the original spent fuel pool systems for the purpose of cooling the spent fuel pool. Not only is there debris everywhere, but there is also piping damage that TEPCO apparently had expected not to find. TEPCO continues to bring in water storage capacity as rapidly as possible. The large tanks mentioned on this site a short while back are now arriving on site and are being mounted and connected. 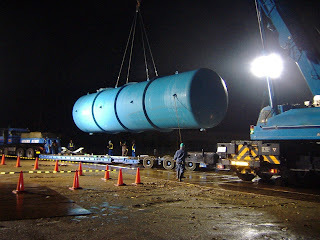 First of our two TEPCO press photo displays is one of the tanks during the night-time shipping routine, chosen to avoid obstruction of roads and thus daytime traffic. 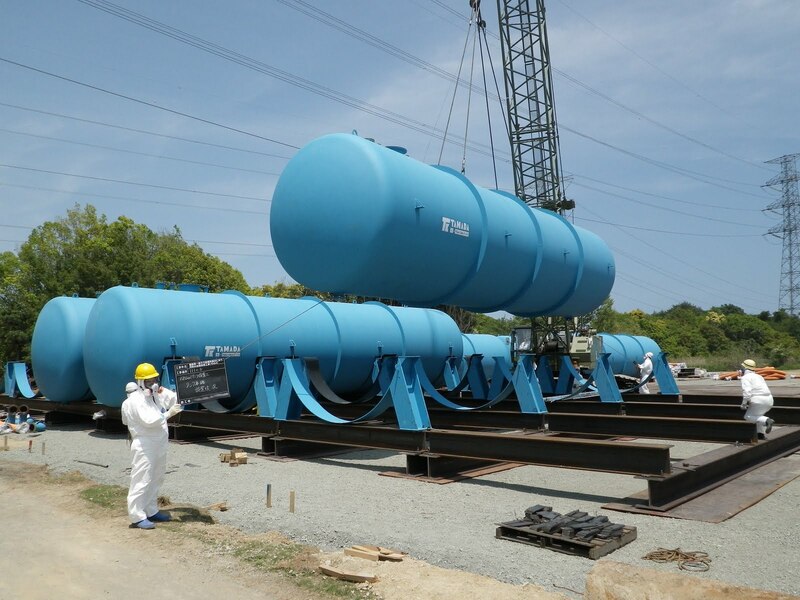 Below, the installation of the tanks at the Fukushima Daiichi site. These are the most important confirmed details at the moment. More to come. First.. there are reports circulating in the press, seemingly particularly on anti-nuclear sites and anti-nuclear leaning big media that the Japanese are submitting a report to the IAEA that "admits" total core melt and some core material exit from the reactor pressure vessels at all three affected reactor plants. This has been reported on this blog for months. It is not new; it is not news. This blog may have been the first to begin quoting ORNL SBO scenario analysis indicating core material falling below the core support plate and damaging, first, lower vessel head penetrations ... which reports seemed likely to match up well with the events known at that time to have occurred and to be occurring at Fukushima Daiichi. It was probably also the first to speculate on the possible failure of the support plate and quenching of the core material in water still contained in the bottom plenum, among other things, a long while back. Readers of this blog were already aware of these kinds of possibilities and events and, upon reading this report, would find nothing new or surprising in it. This gives our readers both pro-nuclear and anti-nuclear a definite leg up. Now, briefly, there has also been an oil spill reported at Fukushima Daini. Repeat-- this is the other plant, further south, with four reactors. This oil spill is under control and is minor. First, the oil separation tank. The next .. and last .. steps shown are desalination and water treatment, although there is planned to be one further desalination and treatment step beyond this which is not yet built. 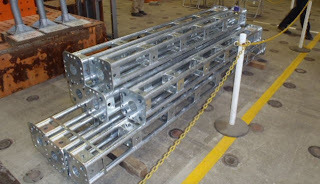 TEPCO has begun installation of 32 steel support beams below the spent fuel pool in No. 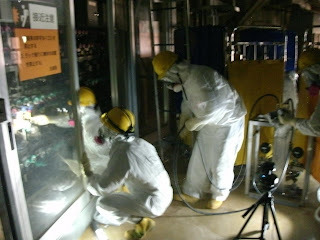 4 plant at Fukushima Daiichi. 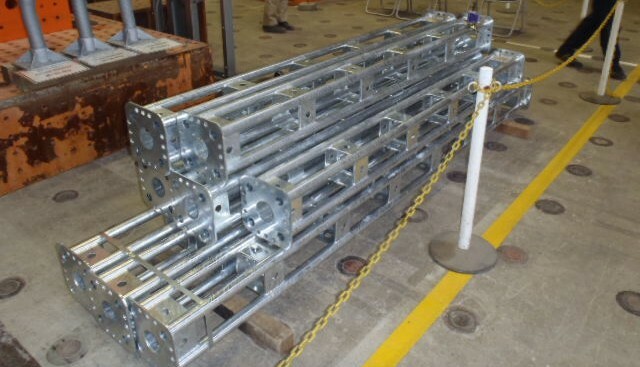 More TEPCO press releases show the location of this work, the beams as received at the plant, and two of them actually installed helping support the spent fuel pool itself. A number of developments have occurred since our last report. NISA has completed a first review of data demanded from TEPCO relative to plant indications and personnel actions in the early days of the accident and according to press reports has concluded that serious core damage began to occur at the Fukushima Daiichi site's No. 1 reactor only several hours after the tsunami. Specifically, the reporting indicates that fuel exposure (to a steam only environment I assume) began two hours after the tsunami and core melt began a total of five hours after the tsunami. Damage to the other two reactor cores (No. 2, No. 3 plants) did not begin until 79-80 hours after the tsunami. 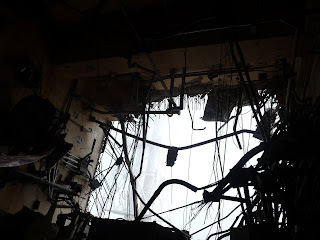 The estimate of the very early damage by NISA is in line with statements that, for whatever reason, the isolation cooling system was shut down very early into the accident; these statements were made by TEPCO within the last month. Further indication of the serious damage at No. 1 plant is the fact that TEPCO's new, temporarily installed pressure gauge at No. 1 plant is reading essentially atmospheric pressure or slightly above. This means that -- IF the gauge is correct -- the reactor vessel is in much better communication with the outside environment than might previously have been assumed. In other reports, NISA has calculated that the core melt events at the three reactors likely produced from 800 to 1000 kilograms of hydrogen at each of the plants. As we've detailed here many times, this hydrogen came from both the metal-water reaction of the zirconium-alloy ("zircaloy" is the trade name) fuel rod clad and from some radiolytic dissociation of water. This is the hydrogen that exploded and caused the damage of the reactor buildings. For comparison purposes, if we convert to standard measure and find that the Fukushima plants developed from 1760 to 2200 pounds of hydrogen each and compare with the something over 700 pounds developed at Three Mile Island 2, it becomes obvious why the reactor buildings were so severely damaged at Fukushima. At TMI, the hydrogen burn caused a pressure pulse (of about 28 psig if I recall) but did no permanent damage; the hydrogen burn was contained entirely inside the reactor containment (which is of an entirely different and probably superior design.) The damage to No. 1 and No. 3 buildings is obvious; damage to No. 4 building was due to hydrogen leaking INTO that building from No. 3 plant's common vent. The hydrogen explosion at No. 2 plant was more contained but damaged the suppression pool or "toroid" below the plant. Water injection to the reactor cores continues as noted in previous posts. Injection to spent fuel pools continues occasionally, with hydrazine added as TEPCO deems necessary (this is a corrosion inhibitor.) Temperature of No. 3 reactor is climbing slowly, and has been since May 28th. As a result of the video of steam release in the No. 1 reactor building many people have commented or e-mailed asking just where this steam was spotted by the robot. The TEPCO map below shows clearly the location of the pipe penetration in the floor. The date of the above illustration is June 4. As noted previously TEPCO continues to bring a great deal of tank capacity on site, in order to get a leg up on the buildup of water from core injection; this has been occurring over roadways to the site since June 4, according to TEPCO press releases. Labels: "fukushima daiichi" "nisa" "tepco"
New TEPCO release depicts dust inhibitor spraying operations at No. 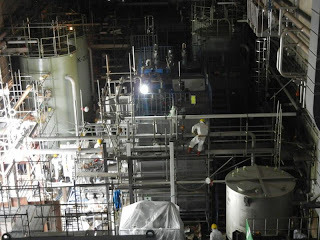 2 plant, Fukushima Daiichi site. As with previous links of this nature this video is hosted on the new Atomic Power Review YouTube channel, started up May 17th of last month. Tokyo Electric Power Company has released a video, taken June 3 by a robot during a survey inside No. 1 reactor building, showing steam rising around pipe penetrations. Video below courtesy TEPCO. According to reports there are local radiation levels between 300 R/Hr and 400 R/Hr in the approximate vicinity of the video shown here. TEPCO also released more photos from inside No. 1 plant, showing the new temporary pressure gauges installed to indicate pressure in the reactor vessel, and some workers in the area of the new gauges. 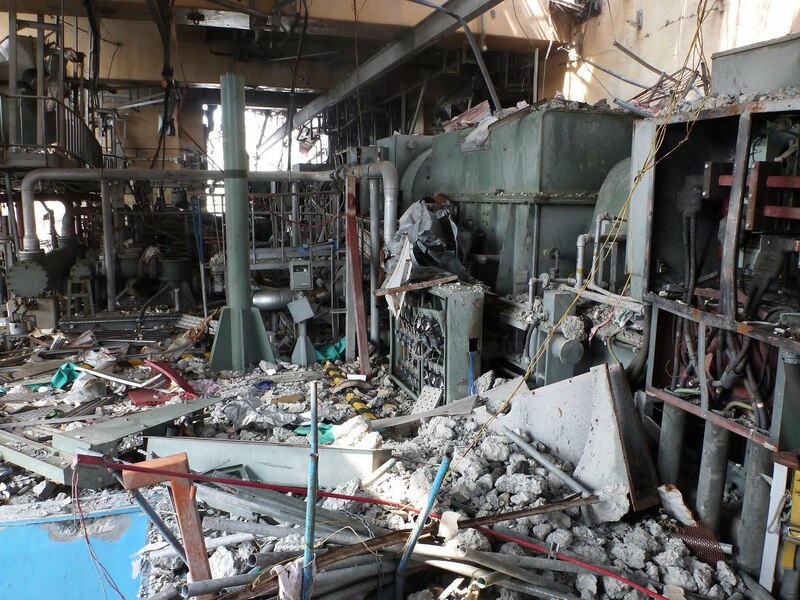 Two pics below courtesy TEPCO. It has been nearly three months since the beginning of the Fukushima Daiichi Accident, which itself properly cannot be defined as being 'over' and in fact now is proving to be an affair as protracted as anyone familiar with such scenarios (all of which have until now been only theorized) might have imagined. While the struggle to perform many crucial tasks continues on site, another struggle rages on all around the world; that struggle is for the majority opinion regarding nuclear energy. In some places, there has been a media fueled knee-jerk anti-nuclear response the like of which has not been seen before. Witness Germany, which has announced its plans to rid itself of nuclear energy by the year 2022. While there are numerous theories about many political motivations for this plan... which is actually a revived plan temporarily stalled by Angela Merkel, who now supports it ... the fact of the matter is that it is being hailed in some quarters as indicative of that attitude which all environmentally responsible persons should strive to adopt. Italy has announced as well (some time ago, actually) that it will no longer pursue nuclear energy. Switzerland also will follow. 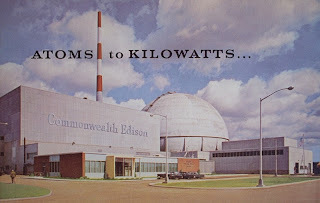 On the other hand, in some places the nuclear energy aspirations continue exactly as before with no change. Witness Saudi Arabia's just-announced plan to have 16 plants on its grid by the year 2030. Economic reasoning, not environmental hyperbole, is the driving factor behind this program. Somewhere in the center, in a much more nebulous position, is the United States. The USA has no central nuclear energy policy, and has had none for decades. 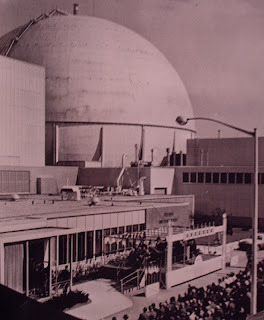 After it became perceived generally that the Atomic Energy Commission was in an all too powerful a position vis a vis nuclear energy, given its mandate to regulate but also its mandate to promote, and seeing that the NEPA did not have entirely the desired effect, the Congress abolished the AEC in 1974, assigning its duties to an office which now is part of the Department of Energy (the promotional and research duties) and to the newly formed Nuclear Regulatory Commission (the licensing, oversight / regulatory, and punitive duties.) At that point, with environmentalism newly developing, the Congress essentially set up a department that was as powerful in an anti-nuclear sense (the NRC) as the AEC had ever been in a pro-nuclear sense. Following this, the only body in the country that was part of the government and which could be considered as pro-nuclear was the Joint Committee on Atomic Energy, or the JCAE. After the JCAE fought on by itself with some limits (it also lost some powers in 1974) it finally fought its last after heavily promoting the Clinch River Breeder Project (an attempt to improve the fuel cycle economics of nuclear energy) among other things, and was disbanded by Congress in 1977. Its duties were spread around to roughly 24 different subcommittees. At this point -- 1977's disbanding of the JCAE -- pro-nuclear forces in this country no longer had any hope of centralized support from the federal government, and this was absolutely deliberate. Instead, the reverse has been seen; as pointed out recently by Rod Adams, the NRC has never in its existence received an initial application for a nuclear plant, processed it, granted licenses and then seen that plant given an operating license. To be clear, the approval rate for new plants start to finish then for the NRC is ZERO; all plants ordered after formation of the NRC were cancelled. No agency or committee could be thought of then as being more obstructionist than the NRC, whose job very clearly would, given its track record, seem to be to prevent the construction of any further nuclear plants in the United States. Recently, over the last two years, there has been a growing surge toward new nuclear plants in the USA; many including this author call this the Nuclear Renaissance. Much of the attention was given to the Westinghouse AP1000 plant as a leader in the new generation of plants, but recently some very suspicious "whistle blower" letters to the NRC caused a very public negative statement about the AP1000 and Westinghouse in general to be released. To its credit, Westinghouse responded strongly (but calmly) and publicly to this almost unprecedented NRC action. Further, the NRC has not only issued a number of statements (and its officials have been quoted in the press) along the line that Fukushima Daiichi means we must review all plants in the United States for safety but now has released a statement indicating that there have been indications to the NRC that it is "too lax" in regulating, and this is why the new tough stance. Let me be clear: This is a "straw man." There are no such statements. No one can possibly think for one moment that the NRC -- with a zero order-to-on-the-grid approval rating -- is too lax. The NRC is in fact quite the opposite. Its chairman, Gregory Jaczko, is not in the position he is in because he is an experienced nuclear engineer or plant operator; he is neither. It would seem that he is there because he is anti-nuclear in point of fact. Taking all of the above into account, I now get to the heart of the matter at hand; what then is the nuclear industry as a whole, and the mass of pro-nuclear advocates to do with the NRC? Surely the NRC cannot be imagined to be PRO-nuclear at any point since clearly its duties were set up from the first to be ANTI-nuclear. Surely with appointments of anti-nuclear persons to the NRC in high places it cannot be assumed that the NRC will support, much less befriend, anyone pro-nuclear. The plain fact of the matter is that it is vitally important that the NRC only regulate plants, provide oversight, and not have any input from any political agendas. In order that this be possible, it is essential that all of the most senior persons in the NRC have serious experience in the nuclear energy field. There is no excuse why a governmental regulatory body such as the NRC should be staffed with politically chosen appointees instead of people accomplished in, and recognized in, the field. This must be pursued. Since this is not likely ever to happen, it then becomes essential that the pro-nuclear groups (and that can mean everyone from the large trade groups to the individual bloggers and authors) call the NRC on every politically motivated action it takes, and on every obstructionist action it leverages. It is also vital that "straw man" arguments (indicating that there is some sentiment when there is not, some statement when there is not, some accusation when there is not) be rightly identified and exposed for what they really are. It is also essential that the NRC's gross exaggerations about supposed lapses in judgement, incapabilities of analysis, and errors in calculation by reactor vendors, architect-engineers, utilities and contractors be spotlighted for what they are. Of course, 'big media' will never report on items seen in this agency's reports. They're sensible, and not panicked hyperbole. One of the reports of interest at this agency's site covers the ability to manufacture forgings of the size needed for Gen III nuclear plants.. and how we don't have that capability here in the United States. (We can still make forgings large enough for plants the size that we have now, if needed.) A number of interesting reports on development in, and the future of, nuclear energy are available at the site. Nowhere near what is at the NRC site in a negative sense, but significant in a positive sense even if small. They cannot have their cake and eat it too. Other forms of energy cannot ever economically provide base load power like nuclear energy can, and all the figures point to that. The recent push back against the economics of nuclear energy and our growing need worldwide for electricity is purely driven by unrealistic fear of nuclear accident, specifically because of Fukushima Daiichi. The environmentalists must now either as a result backtrack on their decades of global warming diatribes if they are to allow wholesale shutdown of nuclear (recently one of their darlings, now a stepchild again) or else become better informed about the actual safety of nuclear energy if global warming is to be averted. It seems at the moment that the NRC is acting as their lap dog, which is unfortunate at best and diabolical at worst. As pro-nuclear advocates go, we may find ourselves at a watershed moment when nuclear literacy is in demand, when the NRC is being exposed for what it really is, when the NRC and the EPA might actually be thought of as being at odds (given the CO2 emissions that will increase if nuclear is abandoned) and when little media such as the blog you are reading is getting 1200 page views a day from all around the world, or better. At the surface it seems a bad moment for pro-nuclear advocacy but in point of fact there may be no better hour to act boldly, with confidence that what the public really wants is the truth, and results.. something the EPA, global warming advocates, and the NRC cannot hope to produce. Note: Fukushima Daiichi update to come later this evening.